As one reviewer puts it, the InStyler is basically an "extreme curling iron." Simply pass a lock of hair between a bristle-lined clasp and a rotating, heated barrel to either curl or straighten your hair. The InStyler works almost as well in real life as it does in the infomercial -- at least for most owners. Users say this device does a good job of both curling and straightening hair, though there's a bit of a learning curve involved. A couple of TV news reporters get largely positive results in their tests -- with a few dissenting opinions. On top of all that, there's video evidence: several YouTube video reviews demonstrate its straightening and curling prowess. We did find a few complaints about the InStyler. Several reviewers and owners say that the unit is somewhat awkward to use and that they burned themselves when first using it. It is also a bit on the noisy side, at least compared to other curling or flat irons. A few women say the InStyler isn't any faster than other hairstyling devices. 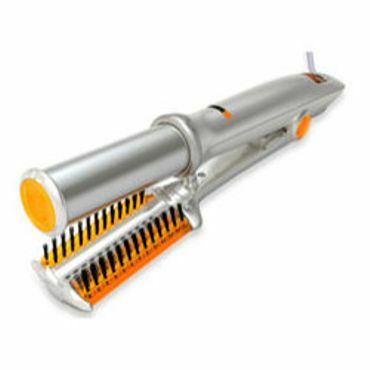 Others warn that the size of the roller does not allow users to place it close to their heads. Some short-haired owners even burned themselves attempting to straighten their roots. On the customer-service side of things, some consumers report the InStyler infomercial -- which advertises a 30-day trial for only $14.99 -- conceals the fact you have to buy two InStylers at a time for $140 once the trial expires. Numerous users found they were billed the full amount before the 30-day trial ended and had to haggle with customer service for a refund. Lauren Keith, who tested the product for KFVS 12 media outlet with a friend, was able to avoid the extra charges: "I was vigilant in shipping the products back in the middle of that free trial period and calling several times to double check I would not be charged in full." We suggest purchasing the InStyler in a brick-and-mortar store with a reputable return policy and where you may limit your purchase to only one.